For 66 years, Surgery has published practical, authoritative information about procedures, clinical advances, and major trends shaping general surgery. Each issue features original scientific contributions and clinical reports. Peer-reviewed articles cover topics in oncology, trauma, gastrointestinal, vascular, and transplantation surgery. 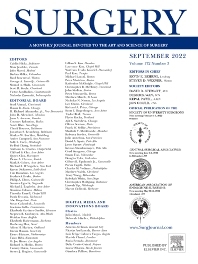 The journal also publishes papers from the meetings of its sponsoring societies, the Society of University Surgeons, the Central Surgical Association, and the American Association of Endocrine Surgeons. Surgery ranks among the most cited journals in the field and is recommended for initial purchase in the Brandon-Hill study, Selected List of Books and Journals for the Small Medical Library. Surgery is indexed or abstracted in Index Medicus, Science Citation Index, Current Contents/Clinical Medicine, Current Contents/Life Sciences, and MEDLINE.